Correctly shutting down a Windows computer is very important. Not only can Windows files become corrupted with a sudden and improper shutdown, the hard drive will probably get the dirty bit set and need a scan for errors. Not only that, it’s entirely possible to lose any work that hasn’t been saved before the computer is turned off or rebooted. This is an error common to new computer users turning off the computer without saving documents and closing opened applications first. One of the most common problems with Windows itself is the Windows Update service which can automatically restart your computer without your say so, although there are ways to stop this from happening. There are also many other applications which can ask for a reboot either after installation or when an update has been applied, you may even have a program configured to shutdown the computer when it’s finished its task such as downloading or encoding video etc. However, there are times when you might want the computer to stay on because some important programs are running or you’re doing some important tasks. It could be frustrating or even disastrous if the computer decides to reboot itself because you have forgotten or wasn’t aware of a scheduled shutdown. Here are 4 tools that can help prevent Windows shutting down or restarting until you want it to. 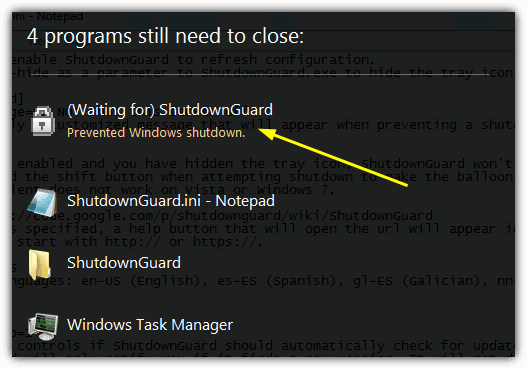 ShutdownGuard is a plain and simple little program that will sit in your system tray and prevent Windows from shutting down, rebooting or logging off. Depending on your operating system you will be warned of a shutdown attempt differently. A tray balloon popup will appear in Windows XP to notify of a shutdown attempt and clicking on the text will perform a real shutdown. In Windows Vista and above, you’ll get the “Programs still need to close” window with the option to cancel or force a shutdown. There are a few options available in the tray menu for ShutdownGuard such as hiding the tray icon, disabling the program temporarily and forcing a shutdown, but there are a few other configuration settings held in an ini file which can be edited with Notepad. The small message Windows Vista users and above will see on the close screen can be configured, the program can be made to behave silently and you can switch between the five available languages. Portable 32-bit and 64-bit versions are available along with a setup installer. 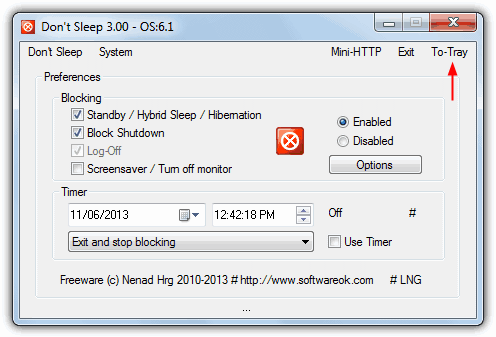 Don’t Sleep is quite possibly the best tool around to prevent a computer from shutting down, restarting, sleeping or hibernating, and can do all this and more from a program that’s well under 100KB in size! It’s also fully multilingual with around 20 different languages supported and even has a potentially very useful feature of being able to control several of the main functions remotely from any web browser. To be able to use the basic function of blocking a shutdown, restart, sleep, hibernate or logoff, all you have to do is run the program and then minimize it to the tray. If anything tries to perform one of those options, it will be prevented from doing so. Don’t Sleep also has a timer function where you can set a specific time or countdown after which you can choose to stop blocking or force a shutdown/sleep. The screensaver and monitor off box is optional and only needed if you want to keep the display visible at all times. Don’t Sleep is a portable standalone executable that works on Windows 2000 right up to Windows 8 64-bit, use the Options button if you want to start it with Windows and control any timed delays for when the program will start blocking after a boot or resume. Prevent shutdown/re-start while a SPECIFIC .exe is running. Retry the download, the file is now hosted on our server. I really didn’t knew about guards like this. Its really brutal when you playing games and some (censored) program closing all your tasks and make undesired restart in middle of action. Thanks. Works as expected. Solved one of my problems, as one of my apps by default forced a shut down of the computer when closing the app.